Yesterday I had the privilege of taking my Environmental Studies students from the University of Colorado,‪ Boulder‬ on a nature solo with Bud Wilson, the Founder of Deep Nature Journeys. The students are members of the Sustainability and Social Innovation Residential Academic Program at ‪‎CUBoulder‬. Throughout the course of the semester, students have spent their time and energy focused on the environmental science behind evolution, climate change, biodiversity loss, biogeochemical cycles, and a range of other topics. The nature expedition and solo was designed to complement their understanding of science with an experience based activity that followed their readings on environmental ethics and values. The goal, following Earth Day, was to provide opportunities for students to spend time alone in nature with nothing but themselves and the natural world to reflect upon his/her place in it and their relationship with self and others, while emphasizing the discovery of our primordial connection to nature. As a part of the process, students were required to leave their virtual reality behind, including technologies, such as mobile phones, computers, watches, etc. so as to engage the true nature of reality in a thoughtful and unobstructed way. 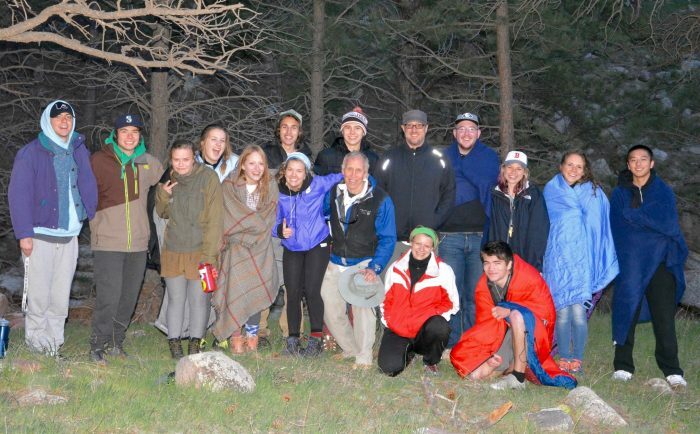 Students were introduced to mindfulness-based practices, processes of self-inquiry, deep listening and awareness training in the wild before being sent to their solo site. They were engaged in experiential—nature sensing—activities, with the goal of activating and exploring the nine perceptual fields of awareness. For me, it was a joy to see students begin the process of cutting through obscurations of perception, while being trained in basic meditation techniques, instruction in Qi Gong energy cultivation and Gaia Flow*, a unique style of body movement that incorporates the principles of Tai Chi. I had an incredible experience, and I’m truly grateful to have been able to work with Bud Wilson and engage America’s future in learning more about what’s real and what isn’t in relation to the grand materialist delusion we know as modernity.